Dental implants are used to replace missing teeth. They are made from a titanium alloy which is well tolerated by bone and forms a firm bond to bone to support replacement teeth that is highly reliable. A dental implant is a substitute for the natural tooth root and is screwed into the jawbone. It provides the foundation for the long term support of crowns, bridges or dentures. 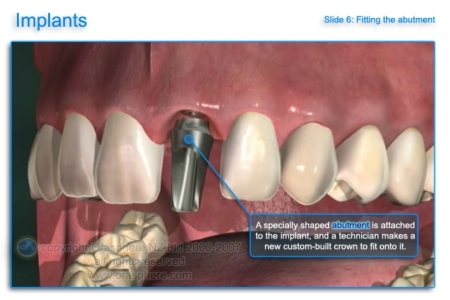 Dental implants are changing the way people look and live. They are designed to provide a foundation for replacement teeth which look, feel and function like natural teeth. 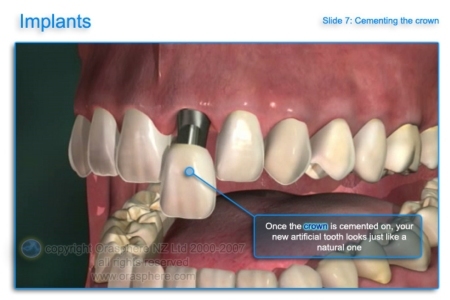 The dental implant mimics the form of the missing roots of your natural teeth. The person who has lost teeth regains the ability to eat virtually anything, knowing that teeth appear natural and that facial contours will be preserved they can smile with confidence. The implants themselves are tiny medical grade titanium posts, which are placed into the jawbone where the tooth or teeth are missing. 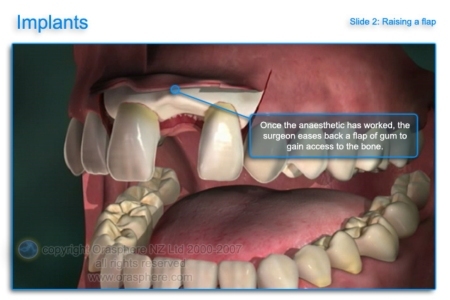 They are surgically placed into the jawbone using a variety of different methods. 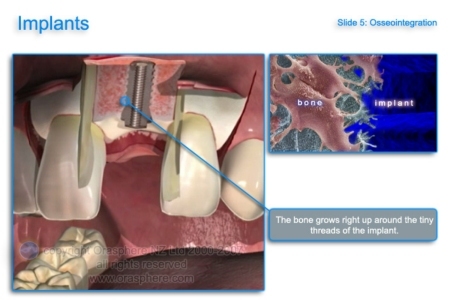 The bone bonds (called osseointegration) with the titanium, creating a strong foundation for artificial teeth. 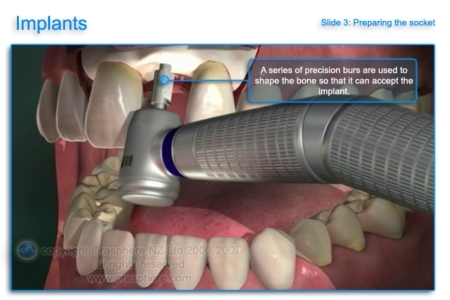 Small posts are then attached to the implant called abutments, which protrude through the gums. 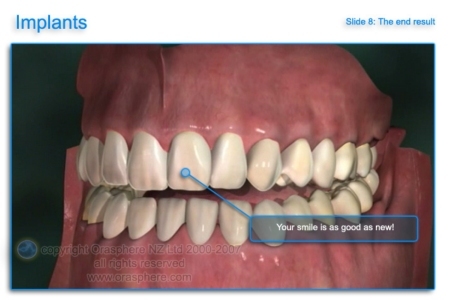 When all of this is successful, your implant will a solid foundation to anchor your final restoration and restore both your smile as well as your function. IMAGE As a bonus, dental implants help to preserve the facial contours as they help prevent the normal loss of jaw bone over time that happens when a tooth or teeth are lost. Implants also help preserve facial structure, preventing the bone deterioration that occurs when teeth are missing. 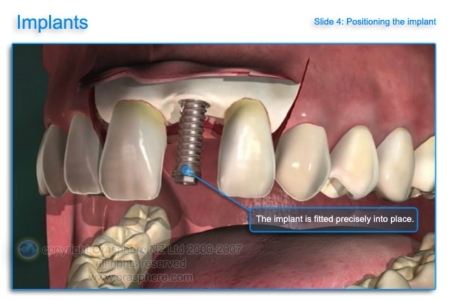 For most patients, the placement of dental implants involves three procedures. First, implants are placed within your jawbone. For the first three to six months following surgery, the implants are beneath the surface of the gums gradually bonding with the jawbone. You should be able to wear temporary dentures and eat a soft diet during this time. At the same time, your dentist is forming new replacement teeth. After the implant has bonded to the jawbone, the second phase begins to uncover the implants and attach healing collar(s). These healing collars will create a natural appearing contour of the gum tissue that helps with hygiene and esthetics. This process takes about 3-6 weeks of healing. 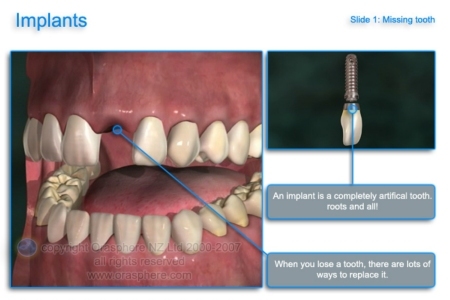 In some patients, this process is performed at the time of implant placement. Next your dentist will begin the process of placing a standard abutment (a device that attaches to the implant that mimics a tooth that has been prepared for a crown), or an impression for a custom made abutment. This abutment which will act as anchors for the artificial teeth. These posts protrude through the gums. When the artificial teeth are placed these posts will not be seen. The entire procedure implant placement, healing collar placement, abutment placement or creation and the placement of the final restoration usually takes five to eight months. Most patients experience minimal disruption in their daily life.